Dog Rocks are back in Stock at Barks and Rec. | Barks and Recreation Pet Services in Trail, British Columbia. Dog Rocks are back in Stock! We had a little trouble over the past two months attempting to get new stock. Three different distributors that we checked in with were all out of stock and awaiting a new shipment. We managed to get our new shipment in today though so come on it to Barks and pick up your Dog Rocks. DogRocks® are a product mined in Australia that helps prevent those nasty yellow burn patches appearing on your lawn. Dog Rocks® have been laboratory tested and is safe for your pet(s). Dog Rocks® filter out impurities from water such as Tin, ammonia and nitrates. These impurities are usually passed out through urine, and when your grass comes in contact with these elements it is burned, resulting in a dead, yellow patch on your lawn. Dog Rocks® give your four legged friend a cleaner source of water, while also stopping the cause of those nasty burnt yellow patches on your lawn. Dog Rocks® will not bring your lawn back to life and need replacing every 2 months. 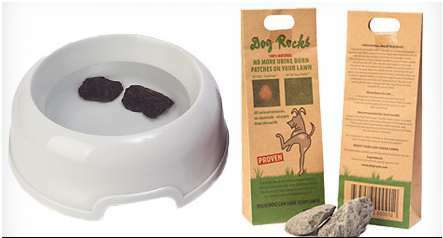 Dog Rocks® have been selling in Australia for 9 years and the UK for nearly 5. Dog Rocks® are quick and easy to use without having to medicate your dog. Simply place the contents of one bag in your dog’s bowl and replenish as usual. PRODUCT DETAILS – Paramagnetic Igneous Rock-DOG ROCKS™ increase the properties of Boron, Barium, Manganese and Strontium while decreasing Tin levels in the water. More info can be found at DogRocksCanada or come in to the store and ask us.